Over the weekend I went to an antiques show in Fitzwilliam NH and bought some vintage menus. The seller had a cache of them from a printer in Manchester NH, all from 1956. An unusual selection on one of the menus caught my eye, a Toasted Chop Suey sandwich. 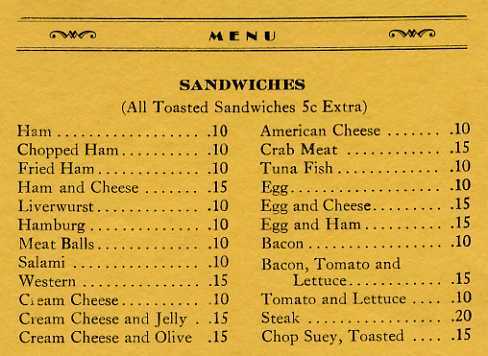 Odder still, the sandwich appeared on a menu from Angelo’s Spaghetti House. It would seem slightly less strange to me if it had been a Chinese restaurant, such as the Chinese and American Red Rose Restaurant in New London CT, where around 1960 diners could order a Chow Mein sandwich. But, upon reflection I have to ask myself why either of these sandwiches should seem odd. I used to enjoy a specialty of St. Louis Chinese restaurants called the St. Paul sandwich which consisted of something resembling Egg Foo Young served between two slices of spongy white sandwich bread slathered with mayonnaise. It was delicious. I don’t mean to single out New England as the home of strange restaurant dishes, but it so happens that I’ve personally encountered two of the weirdest food combinations of my dining-out life in this part of the world. One was in a New England inn with a quaint name and an old coach on the front lawn. It is against my better judgment to go to such places but a visitor from afar expressed interest in it. I have no idea what I ordered but let’s assume it was chicken or beef. Along with it, in a small saucer, came two whole boiled potatoes smothered in tomato sauce straight out of the can. I have to think that the cook was suddenly taken ill and the dishwasher, the only other person in the kitchen, had to take over. At a restaurant in Springfield MA I experienced another culinary shock. I had taken my visiting parents there on the way to the train station because they liked Italian restaurants and it was handy. 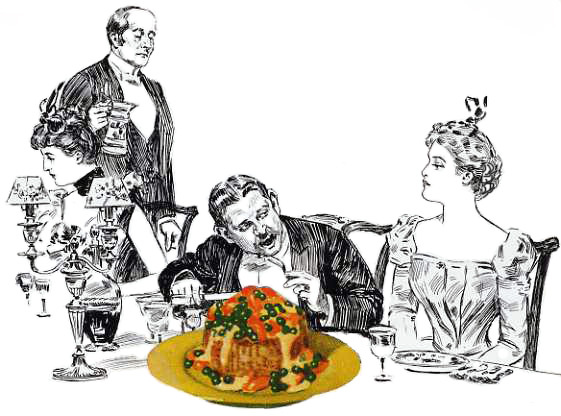 I have forgotten what we ate, but at tables all around us people joyfully celebrated carbo-loading with side dishes heaped with spaghetti AND french fries — in addition to their main dishes. I like spaghetti. I like french fries. But together? Changing the focus from New England to California, “Chili Size” might at first seem like an odd dish but upon closer inspection it is not so much the components that are peculiar – a hamburger patty covered with chili with beans, sometimes with cheese melted on top of it all – as it is the name. On the other hand there may be people who don’t think any of these things are odd. Yes fries and pasta are part of Rhode Island/ma roast chicken dinners served at Wright’s Farm and other restaurants in the Blackstone Valley. My wife is from.Woonsoclet, Road d greecup.on these dinners. Salad, fries pasta and chicken, served family style it keeps coming out until you cry “uncle”. Angelo’s Italian restaurant in Manchester, NH, had the most amazing and unique marinara sauce. I purchased quarts of the sauce every time I passed that way. I have been looking for someone that can tell me what made that sauce so unique. I can’t tell you how much I miss that sauce. One day, several years ago, I stopped in to get a few quarts, only to find that the ownership had changed. . . no marinara. I have been looking ever since. I do know that the family recipe was closely guarded, so I am shooting a dart into the universe. garlic chopped in big pieces (2 to 3 bulbs) 2 bigger onions. add to tomato stir and simmer for a few hours till smooth (is use a immersion blinder for this) salt and pepper to taste. This is the best I can do. I worked there and could never get the recipe. A couple of years ago my Manchester barber was told this by the last owners. You are a saint. I will give it a try. Thank you! Making some this weekend. Still working on amounts of garlic and onions but getting close. I grew up 2 miles from Angelo’s. I grew up on the sauce. Put tomato and spices in a croc pot heat while sautéing the onions and garlic. Once soft pour into croc pot use a emersion blender to grind everything together. Cook in croc pot for about 4 hours. Always eat the next day as it gets better. Hi Jan, Angelo’s Spaghetti House was owned by my gradfather, Angelo Reale. Most of the family worked there in the summer months. My dad Frank Reale did most of the cooking, I don’t ever remember a “chop suey sandwich” on the menu! Does the menu u bought have a cover that reads.. Angelo’s the best pizza on the beach, sweet as a nut? Thanks for bringing back the best memories of my family and “the restaurant” as it was referred to by my family, I loved reading your post. Hello. My name is Ed Sartell. Grandson of the late Frank (Hottie) and Alice Reale, owners of Angelo’s Spaghetti House, Nantasket Beach, Hull Ma. If the menu mentioned in your article is from Angelo’s would you be interested in selling it. My mother and all her family would really enjoy it. As for the potatoes with tomato sauce, that sounds like a recipe from a 1900 era cookbook. Read some of the vegetable recipes from back then – after cooking vegetables “forever”, they needed help from various sauces. A Chinese-American chop suey sandwich sounds interesting, and probably I would prefer it to an Italian-American chop suey sandwich, but at an Italian restaurant in NH in the 1950s, I still strongly suggest this was macaroni, beef, and tomato sauce, probably with some Worcestershire sauce dribbled in and onions and green peppers. Even now in Eastern New England, if one sees “Chop Suey” on the menu of a non-Chinese restaurant, you get the macaroni and tomato stuff, no need in most cases to put “American” in front of it. Only the name is odd, not the food, which can be tasty. I agree that the potatoes with plain tomato sauce could be an inept attempt to reproduce 1890 Yankee restaurant cuisine. Old cookbooks were vague, as we all know. We try to make sure people get their daily potatoes here in Maine, but Western New England and its vast out-migrations must be the mother source of bland from Springfield to Springfield. You may very well be right about the chop suey sandwich. I’m not a native New Englander and don’t know about these things. I love potatoes, but it’s for sure that the boiled potatoes with tomato sauce was an unattractive, bland, and totally awful dish. It did not appear to me that the inn was trying to reproduce old-time cuisine — it was a pathetic place down on its luck and about to close. Another odd New England potato story. Last night — in Vermont — the waiter brings the entrees and says, I’ll bring your mashed and fries in just a sec. Yep, a dish of mashed potatoes and a cone of fries — BOTH come with the entree. This is almost certainly American Chop Suey, a New England favorite made from macaroni, ground beef, and tomato sauce. What a great find, a menu with a toasted chop suey sandwich! No matter how good it was Jan, we Minnesotans are going to deny any relation to an egg foo young sandwich named after our capital, unless you’ve got the provinance! Closest thing I can think of is muh shi rho, with duck sauce in a chinese pancake. On the other hand, sandwiches are a wonderful world, aren’t they? For a long while I was a peanut butter and banana guy. Still am, on occasion. Hi Martin, You’re in the clear! — the origin of the name is unknown.